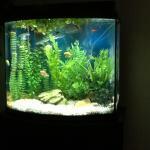 Aquarium Advice - Aquarium Forum Community - horsedogfish's Album: My first tank! Well this is it. Want to add one more fish. 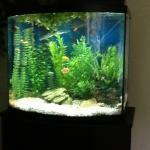 26 gallon bowfront with neons, platies, cories, one dwarf gourami, and glowfish tetras. Want to add a peacock goby (gudgeon) if I can find one. Went to five stores this morning looking. Got some mystified looks in return.